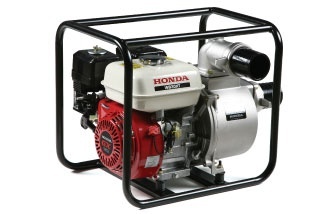 The Honda WB30 water pump is superb for fresh water irrigation, water transfer, agriculture, fisheries and is used widely in the construction and hire industries. It features an industrial grade OHV 4-stroke engine c/w oil alert, a high quality cast iron volute and impeller. The WB30 is mounted on vibration - reducing rubber dampers to ensure smooth running and long life. This pump can pump 1100 litres per minute and 138,000 litres on a single tank of fuel, has a suction head of 8 meters and a total head of 32 meters.